Summer season is here, which means smooth and hair free legs, armpits and bikini-line! 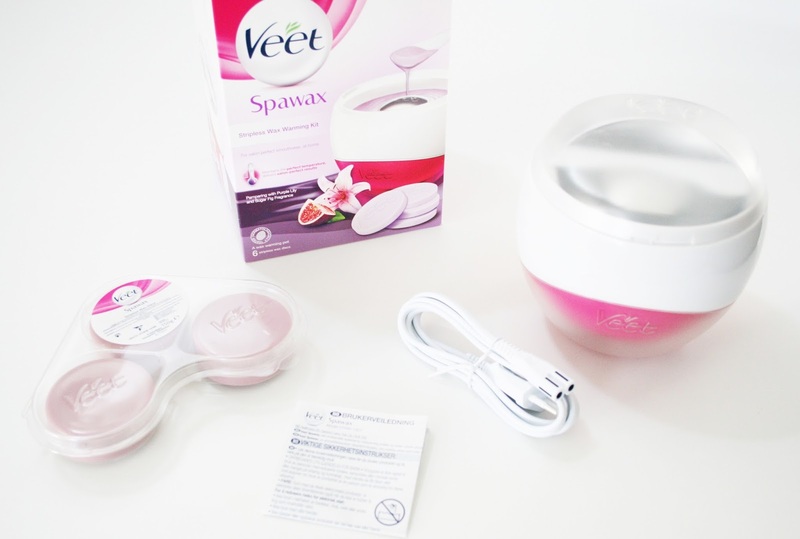 This Veet Spawax Kit, makes waxing at home easy, less painful and keeps you hairs away for up to 4 weeks! Are you like me and love trying things yourself in the comfort of your own home? Then this waxing kit by Veet is going to be right up your alley. I have tried a few different pre waxed strips, the ones you rub in between your hands to warm up the wax, and then place it on your hairs and rib the strip off fast. Those have never really been the greatest success in my experience. Maybe I was doing something wrong, but they basically never pulled out my unwanted hairs and they were stressful, painful and annoying to use. So I skipped out on waxing for a few years and now yesterday I tried this wax kit for the first time, under my armpits and on my leg and this is honestly really good! This still doesn't get all the hairs out at the same time under my armpits, I had to repeat it about 3 times, but it's just way more enjoyable this way, because the kit comes with everything you'll need and you don't have to use strips. You can't really avoid the pain when waxing, so this kit isn't pain free, but it's way less painful and more soothing for your skin. Veet Spawax Stripless Wax Kit (399.95 DKK - £29.99) can be bought in Denmark at Føtex, Bilka and in Matas. Føtex and Bilka have this kit on offer at the moment! In the UK, you can find it at Boots and in the states i'm guessing Ulta, Target and Walmart carries it. I received this waxing kit for free from Buzzador, because I'm part of a campaign. My opinions are though still 100% honest, whether I like or dislike a product.